BrookfieldAngler.com: Casting for Musky...In January?! This year, at least here in Chicago and Northwest Indiana, there has been a strange streak of winter weather. Normally by this time we have had several inches of snow and arctic cold temperatures, but this year is different. Temperatures have been in the upper thirties, forties, and even the fifties all winter long. Up until a couple of days ago, I am pretty sure that Las Vegas had received more snow than Chicago this winter. Call it global warming, El Nino, or anything else you want….I’ll call it awesome. The lakes are still open and the fish are still biting! When Randy Bush sent me a couple pictures of his new year’s muskies that he had caught, I chuckled quietly to myself and within a few hours, my plans were set. 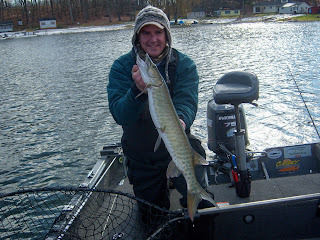 I was heading out to Indiana to cast for musky….in January. The plan was to meet at the launch at 8am. I woke up at 3:30 on Saturday morning and was on the road by 4. I had planned on getting out there around 7:15 and screwing around the launch with my fly rod, but I forgot about the time zone change and ended up getting there a few minutes after 8. When I arrived, Randy and Brock already had the boat in the water so I jumped aboard and just like that, we were fishing! Randy knows how bad I want to catch a big musky on bass gear, so he had a medium action rod with a suspending Yo-Zuri all rigged up and waiting for me. He also brought a 10wt fly rod in case I felt like tossing that around. Brock and Randy each had a Bucher jerk bait tied on – Randy had a semi-natural pattern and Brock went with a bright fire-tiger pattern. With the exception of a couple of follows, we didn't see much action during the first half of the day. We took a break around noon to scarf down some sandwiches and were soon casting again. Finally, the action began to pick up when Randy had a follow. Randy kept this fish by the boat for what seemed like an eternity. This fish just kept circling Randy’s bait but, for whatever reason, just wouldn't commit until Brock’s lure that was dangling in the water caught its attention. Like a bullet, the musky left Randy’s bait and attacked Brock’s like a torpedo hitting an enemy ship! Randy grabbed the net and with a quick scoop, the fish was in the boat! That fish will go down as the one that Brock stole from Randy. Second fish of the day! For the next hour or so, it seemed like the feeding window was in full force. Randy hooked up with one away from the boat, but came unbuttoned after a few seconds. Brock proved he had the winning combo of the day when he ended up with the second fish of the day. Immediately after, I switched over to a fire-tiger Bucher and quickly had one strike that caught me off guard. I was so into the jerk, jerk, pause rhythm that I accidentally jerked again after the fish hit and off he went. Soon after, the feeding window closed and we didn't see much else for the next hour. Satisfied, cold, and tired we headed for the launch and called it a day. I had an absolute blast and was happy that I went. It was also nice to fish with the other half of Predator Pursuit as Brock turned out to be another guy I will end up calling a friend. If you have never caught a musky or just want to do it again, get ahold of the guys at Predator Pursuit. 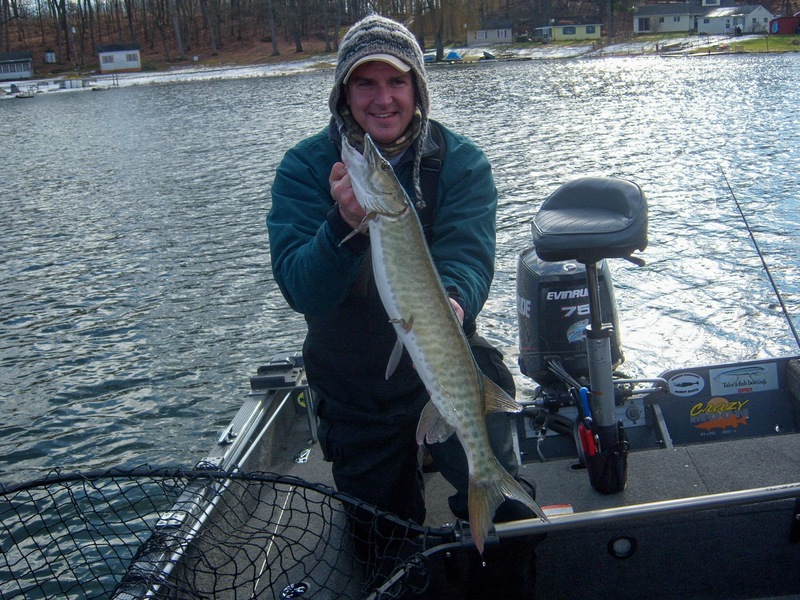 I may be biased, but I am still accurate in saying that you will not find a better musky guide service in Indiana. 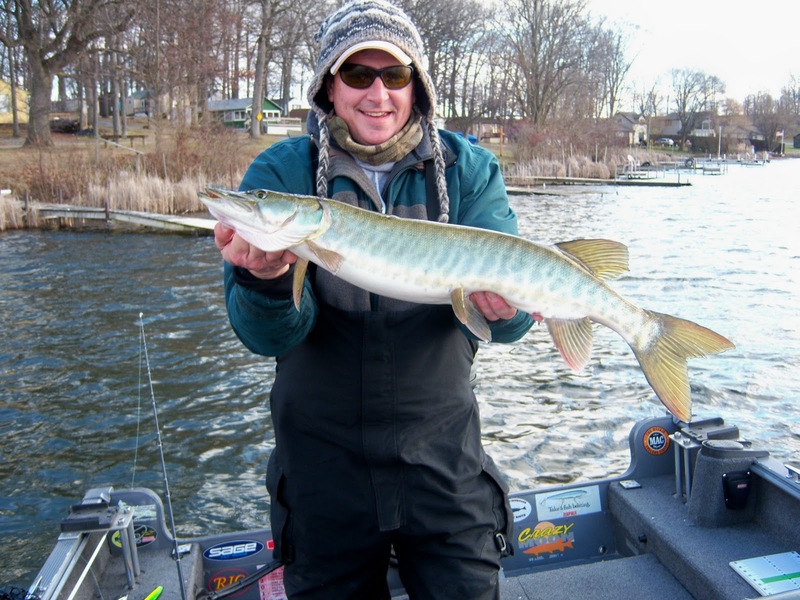 They have all the equipment, all the knowledge, and if anyone can put you on a musky – they will! Here are some more pictures of their fish this year alone! I don't see any fly rods. I know....I ended up not throwing it. It was cold, super windy, and the fish weren't too active. The fly wasn't my confidence set up, so I never gave it a chance. If I had a couple fish in the boat, I would have finished the day with it. 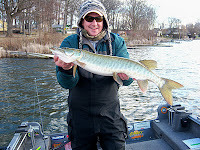 Nice to get out with the buddies and do any kind of fishing, but fishing for Muskie is high on my list. We have tiger Muskie in Colorado and I've struck out every time I've tried to catch one. Brock and Randy had to bundle up that day...those Indiana boys can't handle the cold like us Chicagoans. So if one has to choose between enduring the cold and wind by wearing a hat or by not making it through the day, I say wear the hat!